For Unruly, lackluster, hard-to-hold hair. Provides weightless, brushable, touchable, humidity resistant, extra strong hold and control, while adding texture and natural shine. For WEIGHTLESS HAIR: Apply Rusk Thick to damp hair, mist over with Rusk Shining and style. Lock in and finish with Rusk W8less Plus. This mix gives weightless shine, hold, control and gravity-defying body! Available in 10 oz. or 1.5 oz. travel size. 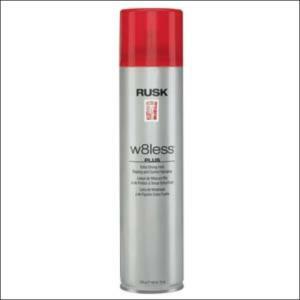 Rusk W8less Spray Gel 5.3 oz.